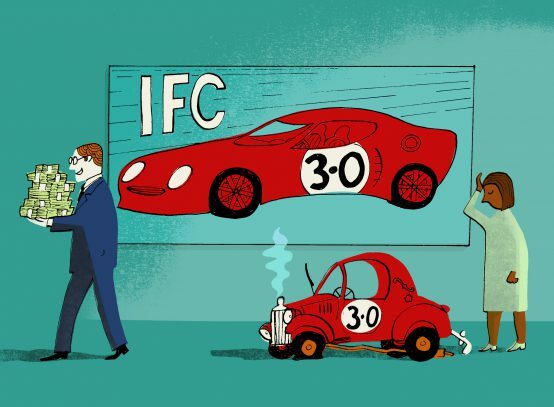 IFC 3.0: superficial upgrades, same problems? Scott Morris of CGD commented that “greater flows of private capital to developing countries and growing constraints on traditional donor aid have raised the stakes for the intermingling of public and private resources.” The IFC has been a strong supporter of this global trend, with an increasing portion of its investments going to financial intermediaries (FIs). In 2016, the IFC made over $5 billion in new commitments to FIs – bringing its total outstanding commitments to $20.4 billion – compared to $3.5 billion in 2011. This is 45 per cent of the IFCs total commitments compared to 29 per cent in 2011. While pushing for more private finance and market creation, the pre-existing human rights concerns with the IFC remain unresolved. Civil Society Organisations (CSOs) and the IFC’s accountability mechanism, the Compliance Advisor Ombudsman (CAO), have raised concerns about the IFC’s investments in FIs in the past, with the main criticism remaining that the IFC is unable to determine their development impact and ensure its investments do no harm (see Observer Winter 2017, Spring 2016, Spring 2015). In March the CAO released a monitoring report of its 2013 audit of IFC’s investments in FIs (see Observer Winter 2015, Bulletin Nov 2014, Update 84). The report found systemic non-compliance by the IFC with its policies and procedures across all stages of the investment process in a global sample of investments in FIs. The report stated that “the IFC does not, in general, have a basis to assess FI clients’ compliance with its E&S [environmental and social] requirements”. According to the CAO, this is a “particular concern” with high E&S risk projects “where the IFC does not have assurance” that its performance standards are being implemented in the projects funded by its intermediaries. While the report “welcomes IFC’s recent commitment to promoting sub-project disclosure among its FI clients”, it documented “gaps in IFC’s approach to ensuring that people affected by the business activities of its FI clients have ready access to external communications and grievance mechanisms”. As “systemic changes” are required “due to the nature of the issues”, CAO stated that it will keep its monitoring process open and that it expects to carry out its next FI monitoring exercise in 2019. In April 2015 EarthRights International (ERI), an international NGO, filed a lawsuit in US federal court against the IFC on behalf of fishing and farming communities in India whose health and livelihoods have been negatively affected by the IFC-funded Tata Mundra coal power plant project. The allegations were supported by a 2013 CAO report finding that the IFC had violated environmental and social standards. In its March 2017 monitoring report, the CAO highlighted that the IFC has not addressed the problems and has yet to respond to any of the CAO’s recommendations regarding the project (see Observer Summer 2015, Bulletin Feb 2014). The district court dismissed the case in March 2016, concluding that the IFC enjoys “absolute immunity” as an international organisation, and is not subject to US courts (see Observer Spring 2016). The communities argued that the IFC is entitled to only the same “restrictive” immunity that foreign sovereign governments are entitled to, which does not include immunity from suits arising out of their “commercial activities.” Michelle Harrison of ERI commented that “the ‘absolute immunity’ standard adopted by the lower court places the IFC above the law, giving it protections foreign states do not enjoy, and allowing it to avoid accountability for its role in harmful impacts inflicted on project affected communities.” In February the communities filed an appeal with the US Court of Appeals for the District of Columbia Circuit. A decision is expected in the coming months. Despite the initial decision by the lower court, the case could set a pivotal precedent that may see international organisations face legal scrutiny of their activities in the future. Another federal lawsuit was filed by ERI in early March on behalf of farmers in the Bajo Aguán region in Honduras, “charging two World Bank Group members with aiding and abetting gross violations of human rights.” The suit arises out of the financial support the IFC and its subsidiary, IFC Asset Management Corporation (IFC-AMC), have provided to Dinant, a Honduran agribusiness operation with palm oil plantations in Bajo Aguán, which the suit alleges is “at the center of a decades-long and bloody land-grabbing campaign” in the region. The plaintiffs in the suit are “among the scores of farmers … who have been shot, killed, and terrorised by Dinant and security forces working on its behalf.” The suit claims that the IFC and IFC-AMC “knowingly financed Dinant’s campaign of terror and dispossession against Honduran farmers”. The CAO found in a 2013 audit report on IFC investments in Dinant that the IFC failed to adhere to its own policies to protect local communities (see Observer Winter 2014, Bulletin Dec 2013, Update 85). The complainants argued that IFC-AMC does not have the same immunity as the IFC, as it is not designated under the US International Organization Immunity Act. Jessica Evans, of Human Rights Watch, commented: “The IFC’s immunity puts communities harmed by its investments at the IFC’s whim. It allows the IFC to violate its own rules with impunity. Holding the IFC to account is long overdue. No institution should have immunity when it causes, contributes to or exacerbates human rights abuses.” The outcome of both lawsuits depends on the success of the challenge to IFC’s claim of immunity.